Behold The Freeway. After joining The Lost, you'll find yourself cruising through the streets on one of these throughout your first few patches. It's our 'neewbie bike'. Quick, durable, and somewhat attractive, it is the perfect choice for' beginners'. It is based on the Harley Davidson Fatboy. Upon reaching the 9th Patch (and forever after that), The Zombie will become your bike. It is fast, heavy, and durable- perfect for experienced riders within The Lost. It is based on the Exile Cycles Hot Rod. Presented before you, is The Hellfury. It is djcool's bike of choice, glorified for its elegence, sinister apperence, and agile performance and speed. No member, other than dj, will ever own this bike. 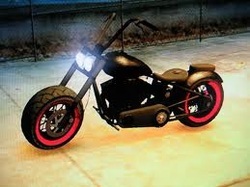 It is based on the West Coast Choppers El Diablo. Pictured above is The Hexer. A unique bike throughout any story mode, it spawns regularly throughout TBOGT Multiplayer. In this Episode, it is The Lost MC's bike of choice, and is able to be ridden by any member of any rank. It is based on a West Coast Choppers CFL. Above is the Lost MC's van of preference, The Burrito. It is heavy, powerful, durable, slightly bulletproof, and nimble (for a van of its size). It is recorded as being the fastest van in the game. The spaced-out placement of its wheels results in an ugly appearance- but also a much less chance of fishtailing and other unwanted driving effects. It is based on a late 1990s Chevrolet Express. The barge above is the Lost MC's truck of preference, The Yankee. It features much more agressive styling and responsive driving ques (turning, acceleration, etc...) then any of its competition. The Yankee is oddly enough a front-wheel-drive vehicle, which provides better grip (on any surfaces) and less of a fishtail effect when corning- and an interesting driving experience, to say the least. It's pickup is rather fast, however its top speed caps off slightly earlier than the other trucks in its class. It is based on a 1990s Chevrolet Kodiak.